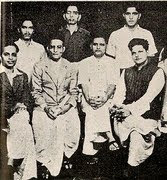 Indian communists were never comfortable with anything called 'Nationalism'. It could be for a reason that communism as an ideology shuns borders and recognizes Totalitarian Internationalism. Where as on issue of toppling UPA-MM Singh Govt on Nuke-Deal they have adored new avatar of Protecters of Indias Sovereignity .They have mastered this art of treachery and deception ,they change their colour much faster than a chameleon. Indian communists should fast change their party symbol to CONDOM , this symbol suits their ideology and their actions . 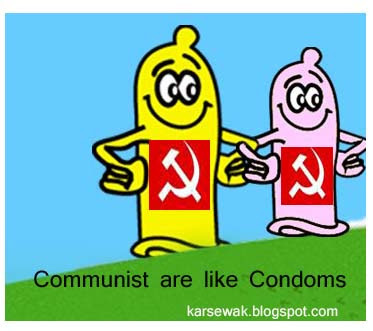 Infact communists are like Condoms, it actually reflect their persistent political stance. A condom allows Inflation , so do our Communists, they have allowed Inflation to grow as high as 11.48% in last 4years . A condom stops Production , so do our Communists, In last 4 years Industrial development has fallen to lowest ebb . By opposing economic reforms and FDI in Insurance, Infrastructure, Aviation and others sectors they halted its onwards production. A condom usage takes away Real pleasure during the Act , so do our Communist , Any association with commies inside the government or outside support to government had proved to be thorn in flesh they never allow one to act smoothly , thus takeaway the real pleasure of any association . A condom can tear off during the act, and not always secure , so do our Communists , one never can rely on their support they can withdrew anytime on any flimsy ground. A condom interferes in natural act , so do our Communists , with their outdated ideology and anti-reforms attitude they always interfere in every policy decision of the Govt. A Condom destroys Next Generation , so do our Communists , They have allowed prices to rise thus have derailed the development, which will be a big curse on Next generation. In end Condom is the loser, after the pleasure act, it is flushed down the drain , so do our Communist, they were used in last 4 years and proved to be thorn in flesh . Now MM Singh have dumped them and going to flush down the drain on the floor of the house. . In a way, the ultimate loser in the Nuclear game are communists. Congress has once again proved it is smarter than the left. But, the future is not going to be smoother for both the parties Congress and Left.